Tom Bancroft cannot recall the defining moment when both he and his twin brother Tony decided to pursue careers as illustrators. Rather, Tom describes a series of ‘tiny light bulbs’. Tom Bancroft at his animation desk. Photo courtesy of the artist. As children, Tom’s drawings were inspired by the Marvel comic books, the Peanuts comic strip and Mad magazine. He and his brother adored watching Ray Harryhausen’s fantasy films and Star Wars. Later, during their teenage years, the twins devoured art books, learning basic drawing principles and copying the work of artists they admired. In college, they discovered stop motion when a friend made a clay animation short film on a Super 8 Camera. That summer, the three students collaborated on a project, leading to Tom and Tony's enrollment at the California Institute of the Arts to study Character Animation. Here they continued to add to their artistic foundation before being hired to work at Disney during their sophomore year! 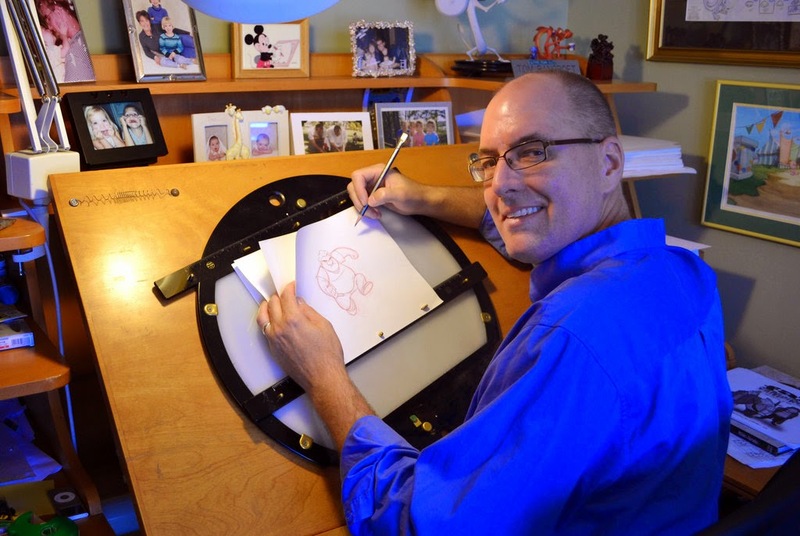 At this time, an illustrator’s success at Disney was determined by their ability to master drawing, performance and animation. Tom’s very first job was as an assistant clean-up artist to Mark Henn, well known for characters such as Jasmine, Belle and Young Simba. From the beginning, Tom made it clear that he hoped to progress to animation but moving up at Disney required working on tiny snippets of film, in the hopes of a better and bigger scene the next time. Drawn as a graduation present for a family friend. Photo courtesy of the artist. Soon enough, Tom’s opportunity arrived when Mark Henn was working on ‘The Rescuers Down Under’. In one scene, the character McLeech kicks a pot of boiling water in rage. Mark’s original close-up of the lower half of McLeech’s body failed to please the directors so he gave Tom the chance to redesign it. One week and six different animation designs later, Tom had his foot in the door! 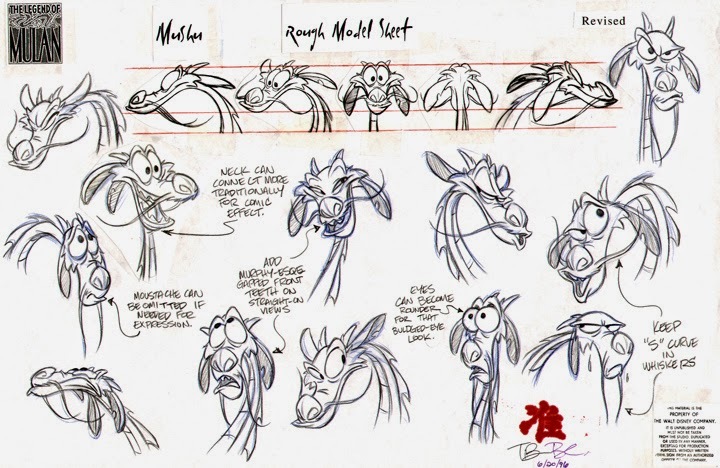 As a first time Supervising Animator, on Disney’s ‘Mulan’, Tom was assigned the character of Mushu the dragon. Although a huge challenge, and with other animators and clean up artists to oversee, Tom remembers this as a ‘dream assignment’. Mushu’s part in the film grew and grew. Recognition came in the form of nominations for an Annie and a Ruben award. Even now, Tom cites Mushu as his greatest creative achievement. And while he hopes to one day surpass this, Tom remains content regardless. Working on an animated film requires a great deal of interaction and communication between different departments. For each sequence, there are multiple meetings held between the heads of each animation department and the directors. Even in the very early stages of animation, each shot is analyzed to identify any potential problems! However, on a day-to-day basis, an animator can easily pop over to the layout department to discuss matters like the dynamic between a pan layout and character. 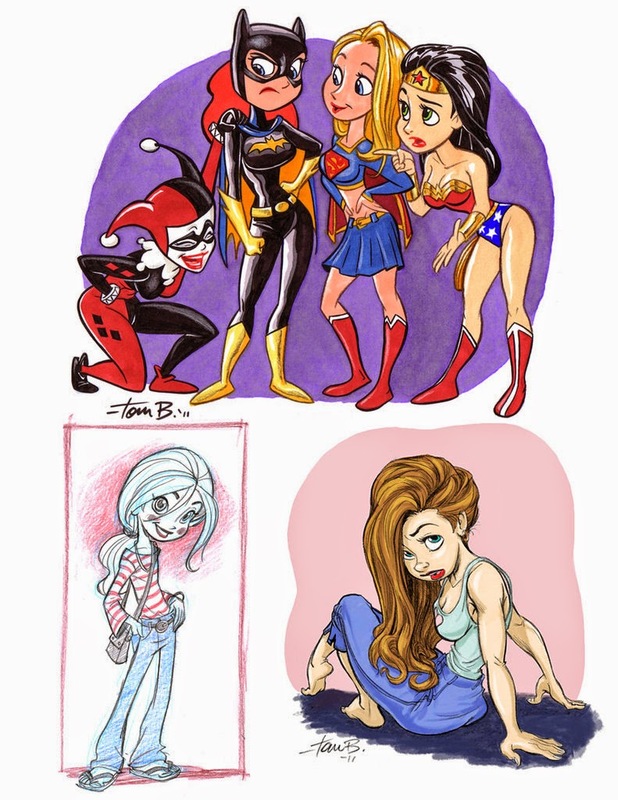 Tom’s passion for comic books, comic strips and literary illustrations has provided a springboard for his career, allowing him to develop in multiple directions. In his younger years, experimentation with these meant that Tom didn’t finish every project. More recently however, he has made the conscious decision to bring every project to completion and get it ‘out in the world’. Tom’s rapidly growing fan base is a testament to this. Yet, for many years Tom didn’t interact with his fans. 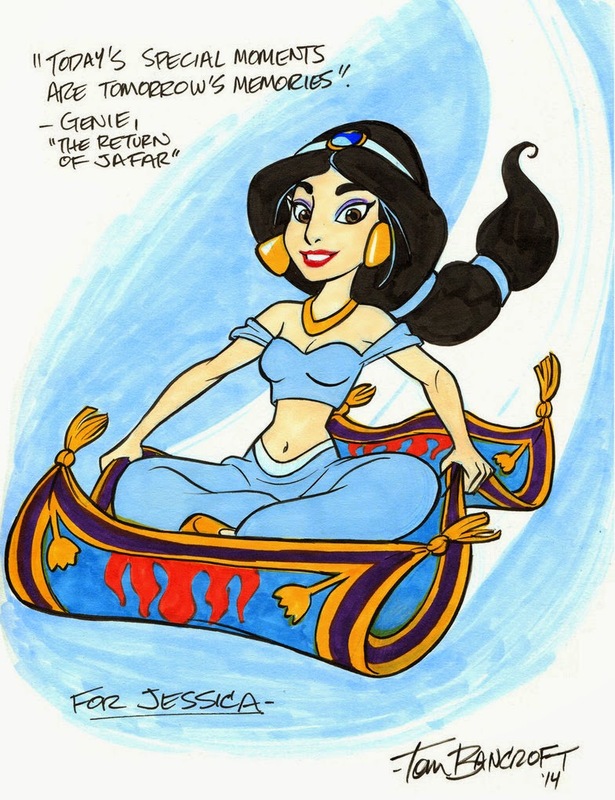 Not during the decade spent at Disney, nor the seven subsequent years co-running an animation development and illustration studio in Nashville. Furthermore, to be an animator and not live in Los Angeles is to be ‘unknown’. So Tom has turned to the internet. 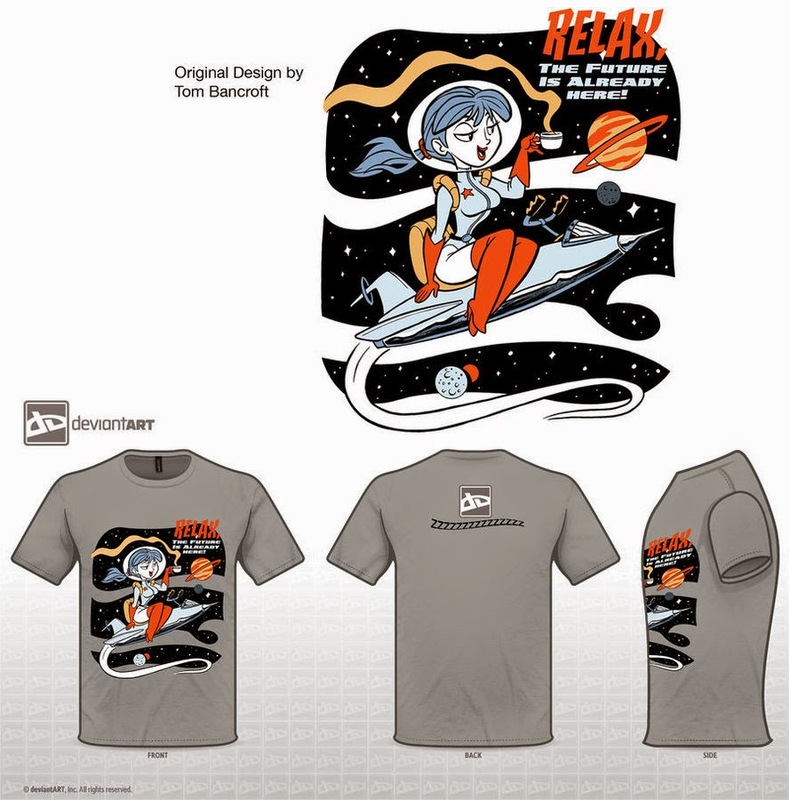 With profiles on Instagram, Twitter, Facebook, Tumblr and Deviant Art, Tom dutifully posts sketches, creates T-shirts designs and responds to as many commission requests as possible. And while he regularly receives invitations to deliver lectures, speak at schools and animation studios as well as freelance opportunities, it is the ‘interaction, especially with fellow artists,’ that Tom truly enjoys. T-Shirt design for a contest with the theme 'Retro Future'. Photo courtesy of the artist. Although Tom’s character design depends entirely on its purpose and patron, his approach always begins in the gathering of as much reference material as possible. Imagine he is designing a beagle dog character. First, he will use an online search engine to collect images of real beagles from as many different angles as possible. After gaining an understanding of their anatomy and natural poses, Tom begins to sketch. He might design between five and eight dogs, each with different shapes and proportions. 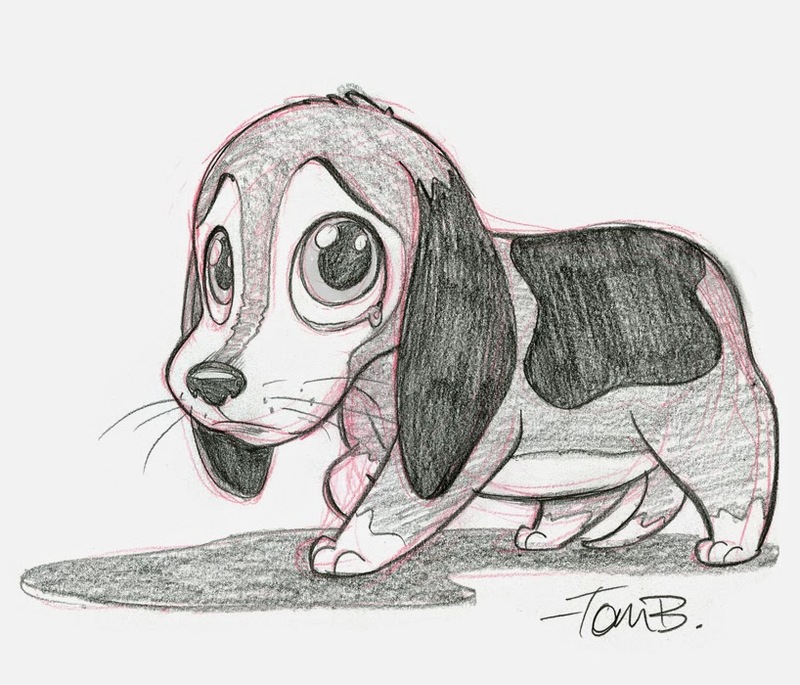 Then, depending on the beagle character’s personality and place in the narrative, Tom will refine his focus and develop just one of these initial sketches. Following a few final tweaks, Tom creates an ink or graphite final drawing to scan into Photoshop. Then a colour model can be made. 'Sad Beagle'. Photo courtesy of the artist. While these pencil and paper drawings account for about 90% of Tom’s work, he is open to try entirely digital animation. Especially as scanning a stack of drawings is ‘not pleasurable’! Realistically, Tom knows digitalization is the future for animators. He and many of his contemporaries ‘hate, complain about and fight’ this… but they also have to be ‘sane’. Today, Tom will tell any young animator to master both traditional as well as computer graphic animation tools. For those aspiring animators seeking advice, Tom champions the belief that one must first concentrate on drawing skills before learning colour, painting and rendering. He explains that this is at the heart even of modern art: ‘knowing what to leave out… is just as important as what you put in.’ It is for this reason Tom is frustrated that many art schools don’t focus on the foundation of drawing. Tom’s own journey continues as he learns to draw better and ‘better every day’. Once dubbed as ‘Disney’ in style, Tom’s artistic voice has strengthened such that, regardless of the subject, his characters are instantly recognisable. This is particularly true for his female characters for which Tom has created a formula of sorts. These figures have been affectionately dubbed as ‘Bancroft Girls’ by fans. Tom also loves to teach. It all began when he created some video-based lessons following his design books ‘Creating Characters with Personality’ and ‘Character Mentor. Today, this takes the form of Taught By a Pro, an online collaboration with Richard Lanham. Similar to digiQualia, Taught By a Pro invites renowned animators, comic artists and illustrators to teach in their areas of specialisation. Subjects include comic strips, comic books, character design, animation, illustration, and video game concept art, among other things. Alongside writing a third instructional book on character design, Tom is the Head of Character Design for the series ‘Superbook’. Aired on the Christian Broadcasting Network, Tom has created character designs for seasons two and three. Yet, Tom somehow finds the time for freelance work and to update his web comic ‘Outnumbered’ every Monday. Semi-autobiographical in nature, this features one man’s journey in the world of women… more specifically his wife and four daughters! 'Outnumbered' posted on April 14th 2014. Photo courtesy of the artist. But what about the future? Tom is adamant that he has not, and never will, stop learning. Furthermore, in recognition of his own artistic mentors, Tom hopes to continue supporting younger artists through Taught By a Pro. And, he is also working on his very own animated feature film. With an outline already drafted, this is just beginning to move forward - so watch this space!